Although I have done no serious sociological studies on this, a lifetime of casual conversations – as well as my own personal experience – have dictated that the eighth grade is essentially Hell. Puberty comes roaring into your life like a mac truck full of grease and confusion, smearing an unclear vision of sexuality on your eyes, and sealing your mouth shut with hormonal anxiety. And through this, you're expected to go to school, read books, communicate with your guardians, and perhaps even start dating. It's a miserable, miserable time. Bo Burnham's new film “Eighth Grade” achieves something remarkable: It captures the universal glorious poetry of that horrid, adolescent misery. With an enormous amount of grace and understanding, Burnham puts the camera right at a 13-year-old's eye level, allowing us to see and to experience every last scrap of awkward terror that Kayla, the shy lead character, feels. Sometimes, merely saying hello to a crush can be a herculean effort. Sometimes being blown off by the popular girl can feel like a twisted and maddeningly temporary triumph. Sometimes you have no idea what you and your dippy single dad have in common. And sometimes you learn to say and do just the right thing in just the right moment, allowing you to survive just another awkward week and give you hope that everything might – might – just turn out vaguely okay. 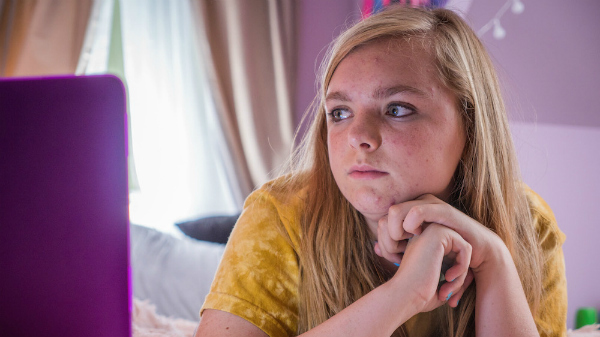 15-year-old Elsie Fisher, as Kayla, perfectly embodies the ambivalent life of junior high. In her spare time, Kayla runs an unpopular advice vlog where she talks about – in that uniquely stilted adolescent way – being bold, finding your courage, and making friends. In reality, Kayla does not follow her own advice and starts each day feeling horrendously unprepared for whatever social anxiety the day may throw at her. She has a crush on a cute, monosyllabic boy, but only seems to get his attention with a few badly placed sexual terms. When she looks up some sexual advice online, she gets a little more information than she can handle. This seems like a very up-to-date yet understandable problem when disseminating sexual information to modern teens. When Kayla is invited to a popular girl's pool party – invited under duress from the popular girl's mom – Kayla may as well have been asked to kill a lion with her bare hands. She knows she's not popular, she knows she's timid, and she can only half-communicate through cryptic Instagram comments. I understand that all people experienced their eighth grade experience differently – if you claim that age 13 was the best year of your life, I'm going to instantly assume you're lying – but it's been said that to be truly universal, one must be truly specific. Kayla is a white girl from the suburbs, and yet her fears and anxieties are something we can all relate to regardless of our age, gender, or location. Thanks to Burnham's deft direction and knowing writing, paired with Fisher's gloriously authentic performance, we instantly sympathize with Kayla, wincing at her pain, and reveling in every small success. Partway through the film, Kayla is taken on a tour of a future high school, and the bubbly 17-year-old who mentors her for the day offers her something she's never had before; someone who listens and converses without judgment. Kayla's brush with high school teaches her all of the best of what's to come... as well as some of the worst; Kayla, in one harrowing scene, seems to be at risk from the unwanted sexual attention from an older boy. How “Eighth Grade” handles that situation is both terrifying and merciful. In a landscape dominated by teen movies that bank so heavily on well-worn archetypes and weepy melodramatic situations, experiencing a film like “Eighth Grade” can feel almost miraculous in how natural it is. Our adolescence is made up of tiny moments that feel big, and big moments we're mortified by. Bo Burnham had previously worked as a comedian, and perhaps his observation in that vocation allowed him to make something with so much genuine compassion. However he arrived here, however, he made one of the best films of 2018.